Peter Torkelson and Vicki Chambard Torkelson have rural Midwestern roots, and reflect the values and neighborliness that a small town upbringing provides. Both err on the side of liberal-arts educations and both have lived extensively overseas prior to settling in Lanesboro. Mementos of Peter’s and Vicki’s travels can be found throughout the inn. Ask Vicki if she was born in Hanska, Minnesota, and she will say “Yes”, but she’s lying. She was really born in neighboring New Ulm, spending her early years in Hanska before truly moving to New Ulm. Her father purchased an old school bus and converted it into an RV of sorts, complete with running water and propane heat, and drove the family around on their vacations. In high school, Vicki found much joy playing drums in the marching band. After attending Macalester College and the University of Minnesota in the Twin Cities, she lived a total of twelve years overseas, including Nigeria, Morocco, and Saudi Arabia, before returning to Minnesota. Prior to innkeeping, Vicki worked for Piper Jaffray in Minneapolis. Vicki enjoys cooking and reading and reading about cooking. She is a wannabe gardener and quilter, and enjoys gleaning wisdom in these areas from guests. Peter has never outgrown his love of treehouses, and regrets that the inn lacks trees suitable for such. His dream as innkeeper is to host mystery weekends, modifying the inn to include hidden cavities, turning bookcases, etc. Peter was born and raised in the western Wisconsin farming community of Baldwin, and wishes he grew up on a farm. He is a graduate of St. Olaf College and the University of Minnesota, choosing to educate himself horizontally by piling up bachelors rather than graduate degrees. He studied in Egypt, India, Taiwan, and Japan, and returned overseas to Nepal for two years as a Peace Corps volunteer, teaching science with bamboo and stone hatchets. 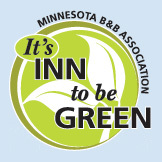 Prior to innkeeping, he worked as an engineer at the Minnesota Pollution Control Agency in St. Paul. His Ukrainian egg hobby started in 1972. Both find that their favorite part of innkeeping is talking with the guests over breakfast.